It will be necessary to continue an indefinite watch on Frazer Bay Hill, since the silica ore is known to be there, and it could be a magnet to some future quarry development, if opposition is not ready, at any time. On a blazing hot July afternoon, in 1947, after a shore lunch in Marianne Bay, Group of Seven artist A.J. Casson with his daughter Margi, Bruce Brown, and Stuart Fraser Cork climbed Frazer Bay Hill. Near the top, on Table Rock, Casson painted a watercolour, looking west, with the mouth of Baie Fine in the near distance. Frazer Bay, on the route of the Voyageurs, and the LaCloche Islands in the mid distance, and Manitoulin Island on the skyline. Some years later, Stuart Fraser Cork’s ashes were laid to rest on the summit of Frazer Bay Hill, Casson Peak, and are marked by a stainless steel memorial plaque designed by A.J. Casson. The North Channel Preservation Society is a non-profit incorporation under the laws of the Province of Ontario. It was initially formed in 1984 to organize resistance to the former plans of Falconbridge/Indusmin Mines to quarry silica ore for glass making, from the south shore of Baie Fine, including Fraser Bay Hill, from approximately where A.J. Casson sat to create the original watercolour of the entrance of Baie Fine. A.J. Casson was not the only member of the Canadian Group of Seven artists to paint from that mountain. Carmichael, Varley and others have also recorded the beauty and serenity of the scene from the top. A.J. Casson, as the last of the Group of Seven, and at age 89, carried on the vigorous traditions which formed the Group of Seven over sixty years ago, by lending his immense talents to the North Channel Preservation Society in the production of the Serigraph “Baie Fine Entrance”, with artist Paul Gauthier, son of his lifetime painting friend, Joachim Gauthier. 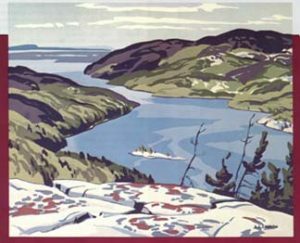 In order to help raise public awareness, and the funds that were needed to finance the campaign to save the mountain, and thus Save Baie Fine, Mr. Casson allowed the Society to produce the Serigraph of the watercolour, and with Paul Gauthier, undertook a leading role in all aspects of the artistic production. A limited edition of 250 Serigraph prints, measuring 20″ x 25″ were offered to the public in 1987. The campaign received much public attention. There was coverage by local and national media, including radio, television, newspaper and magazines. There were treks to the summit with as many as one hundred supporters at a time making the climb. Television, magazine and newspaper interviews were even given at the summit by members of the Society. Many individuals and groups, including tourist, boating, cruising, cottagers, sportsmen, merchants, First Nation, and all those people who were just concerned with the irreplaceable loss the quarry would have caused, organized and pressured three successive Provincial Governments to prevent the destruction. In July 1990. Falconbridge Ltd. voluntarily surrendered, without compensation, its mining claims to the areas of the south shore of Baie Fine. Falconbridge executives decided to assure the preservation of the area by surrendering their legal rights on the condition that the Provincial Government of Ontario withdraw the area from staking and prospecting. The provincial government assured Falconbridge that the area was administratively withdrawn from future claims. This was confirmed by the Ministry of Development and Mines. Though the decision not to issue any new claims was administrative, there is nothing to prevent any future governments from changing it. It will be necessary to continue an indefinite watch on Frazer Bay Hill, since the silica ore is known to be there, and it could be a magnet to some future quarry development, if opposition is not ready, at any time. NATURE CONSERVANCY In 2002 the NCPS donated 10 of the Casson Baie Fine Entrance Seriagraphs to the Nature Conservancy of Canada. The Conservancy approached us for financial assistance in their campaign to raise funds to purchase Strawberry Island, which is the large island with the lighthouse on it, just East of Little Current. The prints were subsequently sold to the public with the original certificate of authenticity signed and sealed by David Cork, the then current NCPS President, as well as a color brochure showing Mr. Casson at work on the serigraph.